Today’s COTD is the new Shadow Paladin strider! 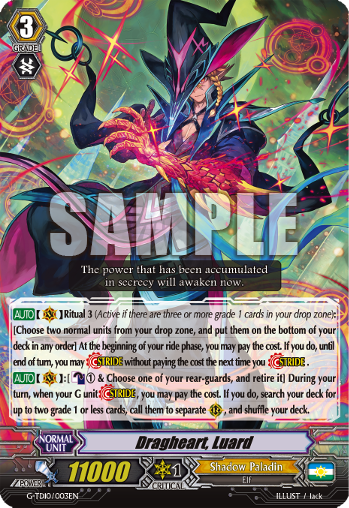 [AUTO](VC) Ritual 3 (Active if there are three or more grade 1 cards in your drop zone):[Choose two normal units from your drop zone, and put them on the bottom of your deck in any order] At the beginning of your ride phase, you may pay the cost. If you do, until end of turn, you may [Stride] without paying the cost the next time you [Stride]. [AUTO](VC):[Counter-Blast 1 & Choose one of your rear-guards, and retire it] During your turn, when your G unit [Stride], you may pay the cost. If you do, search your deck for up to two grade 1 or less cards, call them to seperate (RC), and shuffle your deck.